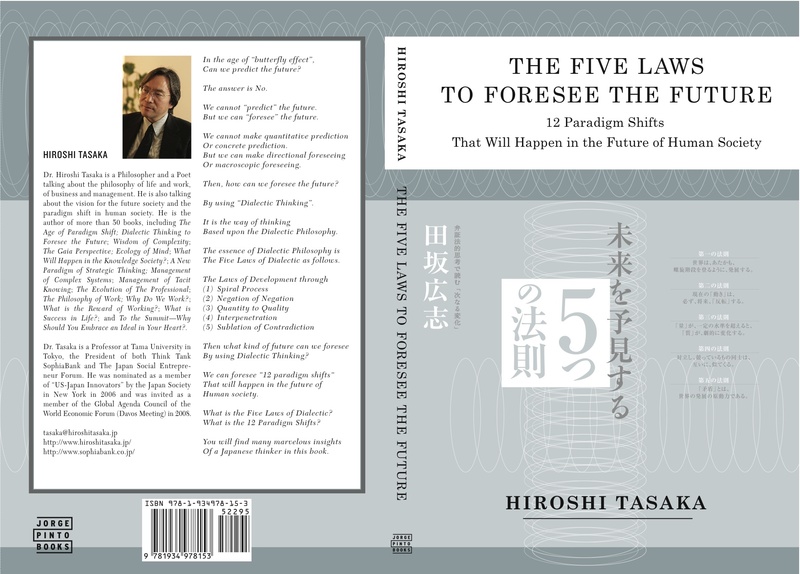 The Five Laws to Foresee the Future. 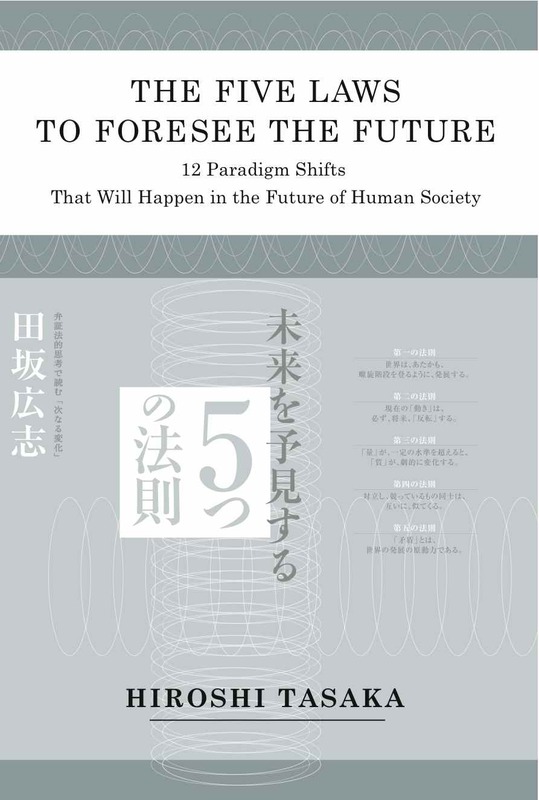 The Five Laws to Foresee the Future.12 Paradigm Shifts That Will Happen in the Future of Human Society by Hiroshi Tasaka This book was originally published in Japanese. What will Happen in the Future of Human Society? We cannot “predict” the future. But we can “foresee” the future. We cannot make quantitative prediction or concrete prediction. But we can make directional foreseeing or macroscopic foreseeing. Then how can we foresee the future? We can foresee the future. Based upon the Philosophy of Dialectic. The Five Laws of Dialectic as follows. The world develops as if it were climbing a spiral staircase. Current “trends” always “reverse” themselves in the future. When “quantity” exceed a specific level, the “quality” changes dramatically. Things which oppose and compete each other come to resemble each other. Contradiction is the driving force for the development of the world. that will happen in human society in the future. You would find very important insights in this book. Hiroshi Tasaka graduated from the Faculty of Engineering at the University of Tokyo with a Ph.D in nuclear engineering in 1981. From 1987, he worked as a visiting researcher at Battelle Memorial Institute and also at Pacific Northwest National Laboratories in the USA. In 1990, he participated in founding the Japan Research Institute and engaged in “Industry Incubation” as a Chief Strategy Officer. In 2000, he became a Professor at Tama University in Tokyo and teaches students the philosophy, vision, policy, strategy, skills, mind and spirit of social entrepreneurs. Also in 2000, he founded Think Tank SophiaBank, a “Paradigm Think Tank” which mission is to change the “Paradigm of Social Systems” in human society to solve the “Global Problems” and “Frontier Problems” for the society. In order to achieve the mission, SophiaBank forms a worldwide network that connect social entrepreneurs and acts as a “Socio-Incubator” that encourages social entrepreneurs to change old paradigm and to create new social systems. In 2003, he established the Japan Social Entrepreneur Forum (JSEF) under SophiaBank to foster and support social entrepreneurs in order to bring about innovation and change in global society. In 2006, he was nominated as a member of “US-Japan Innovators” by the Japan Society in New York. Also, he was invited as a member of the Global Agenda Council, advisory board of the World Economic Forum (Davos Meeting) in 2008. Tasaka is a Philosopher as well who has put forward a wide range of ideas and theories: the philosophy of life and work, of management and business; corporate and industrial strategies, social and government policies, a vision of the Internet revolution and the knowledge society, and also the paradigm shift in knowledge in human society. He is the author of more than 50 books, including The Age of Paradigm Shift; Dialectic Thinking to Foresee the Future; Wisdom of Complexity; The Gaia Perspective; Ecology of Mind; What Will Happen in the Knowledge Society? ; A New Paradigm of Strategic Thinking; Management of Complex Systems; Management of Tacit Knowing; The Evolution of The Professional; The Philosophy of Work; Why Do We Work? ; What is the Reward of Working? ; What is Success in Life? ; and To the Summit – Why Should You Embrace an Ideal in Your Heart?.